Below you find a list of research projects we have ongoing or have embarked on over the years. As a more general introduction into our field and the topics we have worked on, check out our research overview. 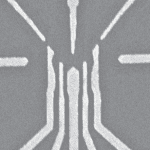 In another path towards scaling up quantum processors that we have been pursuing, superconducting resonators are used to couple distant qubits. A first hallmark goal in this direction is to show that an individual photon stored in a resonator can be coherently coupled to one of our spin qubits. 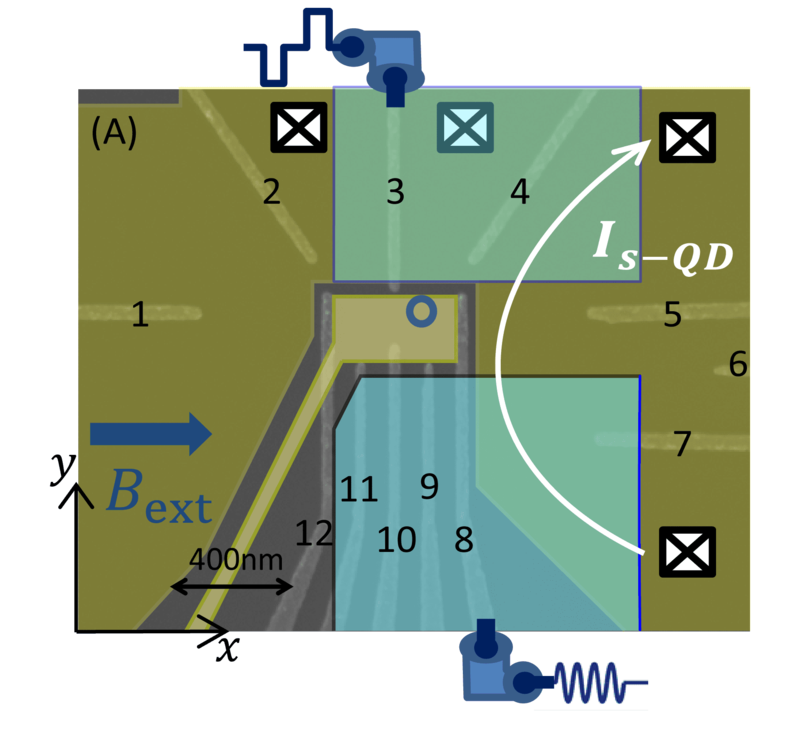 This we have shown recently, as we measured the coupling strength between one of our spin qubits and a resonator-based microwave photon to exceed the relevant decoherence and dissipation rates [Science 359, 1123 (2018)]! See also our own press release. Next up is to see if we can use this mechanism to couple distant qubits in an attempt to combine the spacing and versatility of the superconducting resonator with the long-lived coherence of our single-spin qubits. As seen with other small scale quantum computer demonstrations, combining initialisation, readout, single- and two-qubit gates leads to new challenges involving qubit crosstalk, state leakage, calibration, and control hardware which provide invaluable insight towards scaling up. We address these challenges and demonstrate a programmable two-qubit quantum processor in silicon by performing both the Deutsch-Josza and the Grover search algorithms [Nature (2018)]. In addition, we characterise the entanglement in our processor through quantum state tomography of Bell states measuring state fidelities between 85-89% and concurrences between 73-80%. These results pave the way for larger scale quantum computers using spins confined to quantum dots. See also our Youtube explainer and press articles by the BBC, ScienceNews and others. 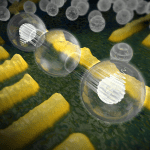 Electrons confined to quantum dot lattices are described by the same physics as those confined in material lattices. By emulating open problems in materials in which electrons become strongly-correlated, one can hope to further the understanding of their emergent electronic and magnetic properties. We show that the control of our quantum dot systems is sufficient to emulate Fermi-Hubbard physics in the relevant regime of strong interactions and low temperatures, where correlations are expected to be at their strongest [Nature 548, 70 (2017)]. The developed toolbox can also be used to calibrate extended quantum dot arrays, a topic we are currently pursuing. For a general introduction, see here (English) or here (Dutch). 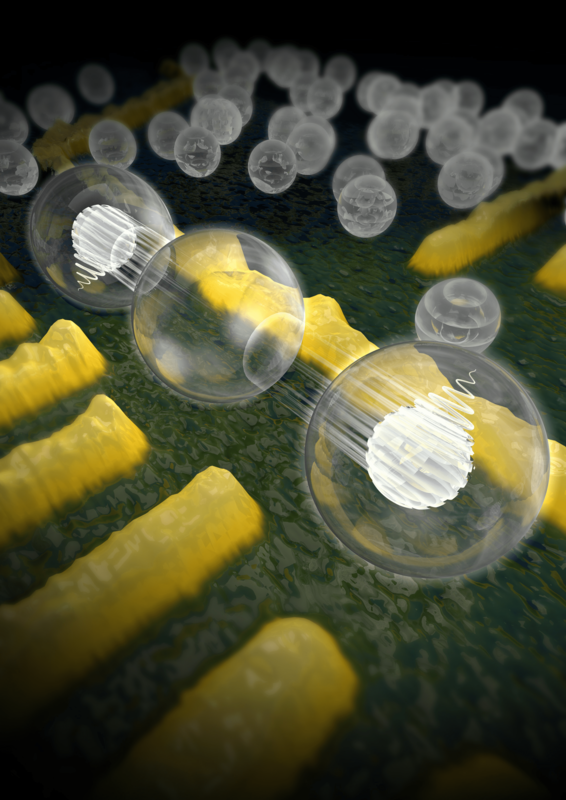 In first efforts at tackling the key issue of scaling, we have demonstrated the manipulation, transport and readout of electronic spin states in a linear array of three quantum dots [Nature Nanotechnology 11, 330 (2016)]. Readout of multiple dots can be done in analogy to the “bucket-brigade” approach of charge-coupled devices (CCD), whereas site-selective control is done using EDSR (see below). As we shuttle an individual electron back and forth in the array several hundreds of times, we see only negligible influence on its spin projection. Furthermore, we have shown how spin states can be coherently shuttled between sites, by separating and recombining a two-electron singlet state in a similar array [npj Quantum Information 3, 22 (2017)]. 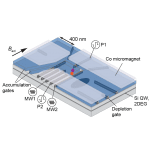 The field has been long looking at alternative semiconducting materials to GaAs as hosts for more long-lived electronic spin states. 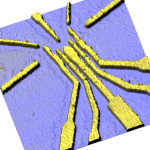 In a collaboration with the Eriksson group (U. Wisconsin), we have shown how strained silicon quantum wells in undoped SiGe heterostructures are a promising future platform for spin qubits. 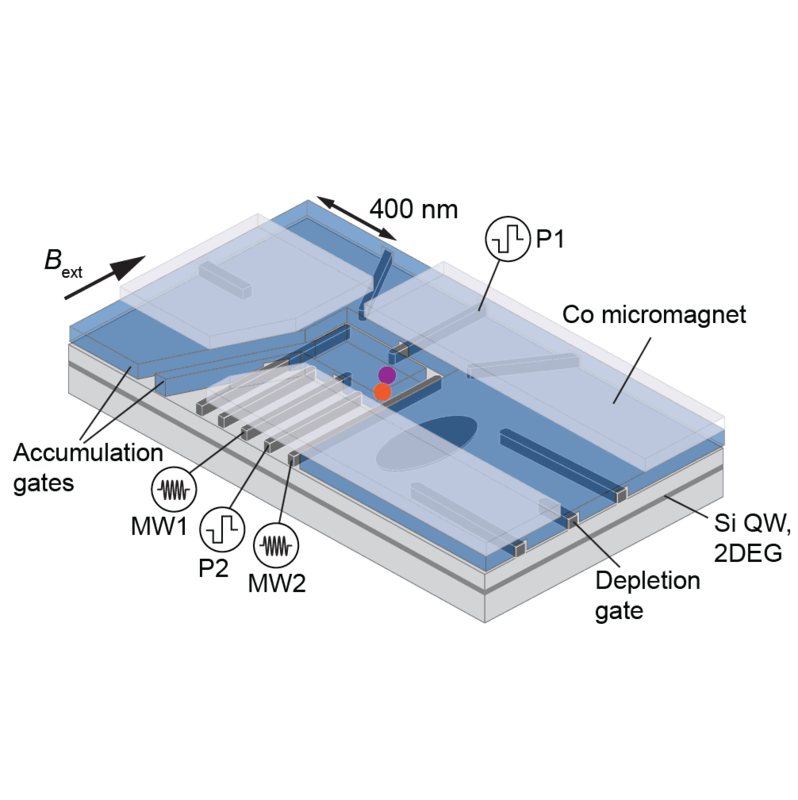 An on-chip micromagnet induced magnetic field gradient allows for all-electrical two-axis control of a single electron spin and a Ramsey decay timescale of 1 μs is observed [Nature Nanotechnology 9, 666 (2014)]. A study of gate fidelity shows qubit control is achieved at sufficient accuracy that any remaining errors can be corrected for using error correction protocols [PNAS 113, 11738 (2016)]. Direct room for improvement lies in the employ of isotopically purified 28Si substrates, which promise even longer-lived spin states. 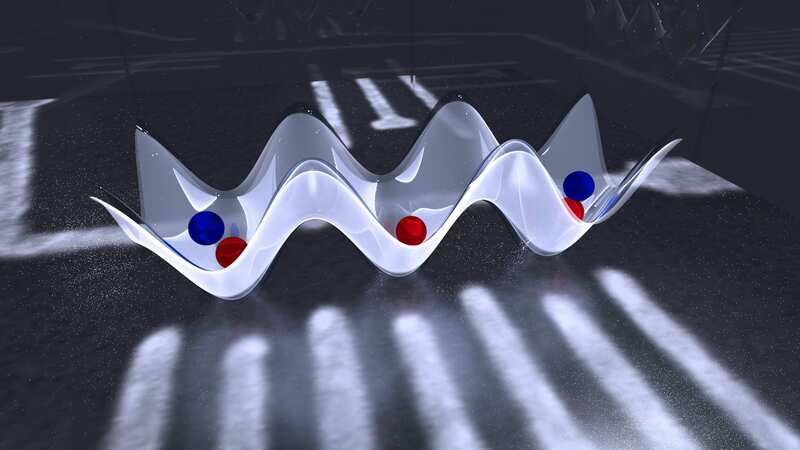 We have shown how a single electron charge can coherently tunnel between two outer, non-adjacent sites in a triple quantum dot array, at a rate that is controlled via the detuning of the energy levels of the middle dot [Nature Nanotechnology 8, 432 (2013)]. 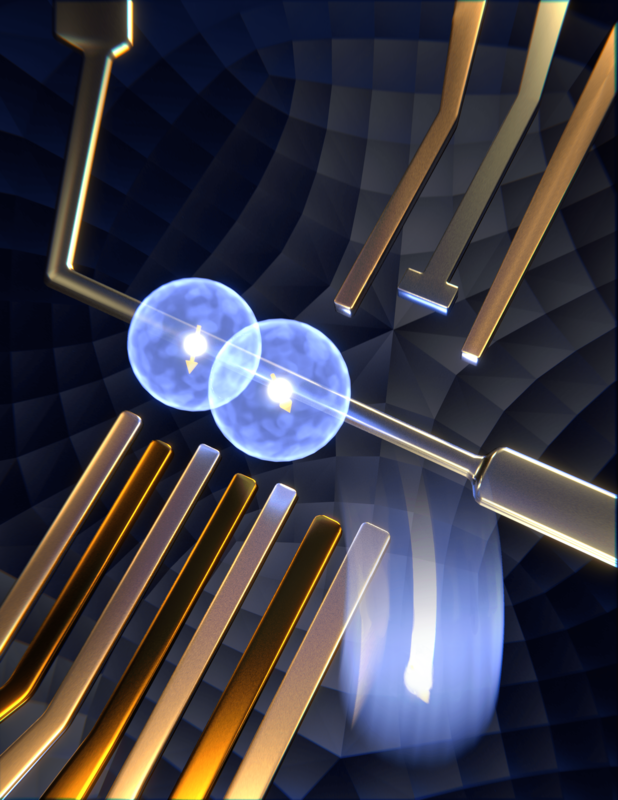 In a follow-up experiment, we place one electron on each of the two outer dots of a similar device. 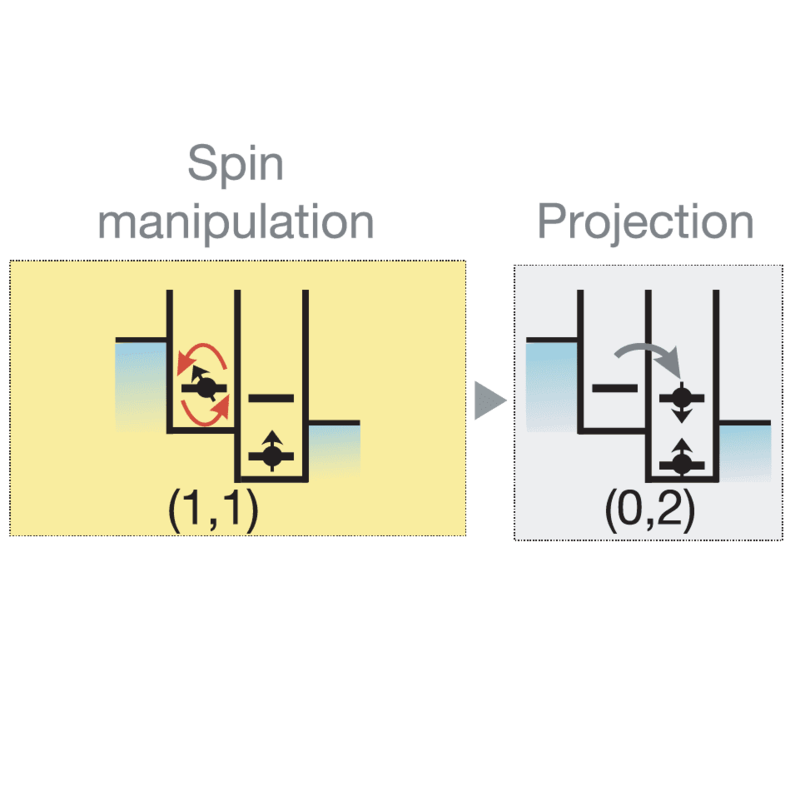 Single-shot spin readout allows us to tune and measure a non-nearest neighbour spin coupling that is reminiscent of the superexchange effect between spins in ceramic materials exhibiting strong quantum magnetism [Nature Nanotechnology 12, 26 (2017)]. 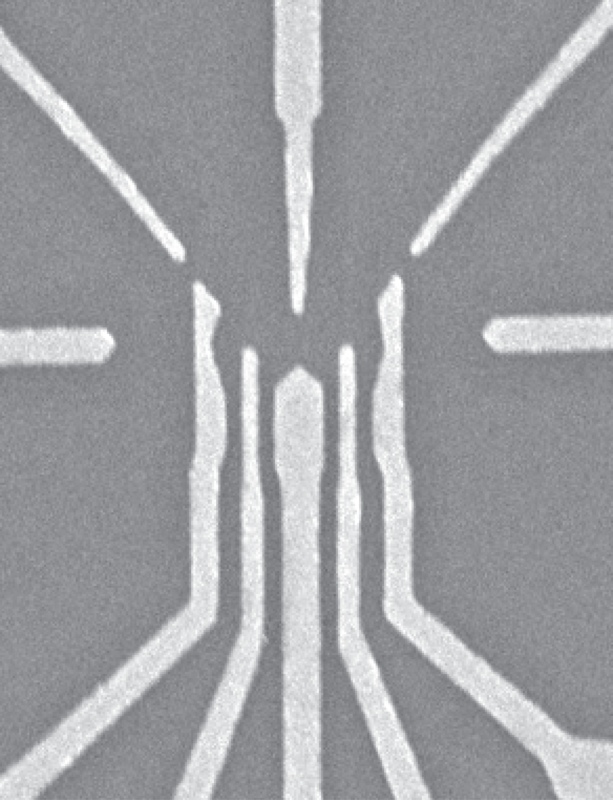 We have realized independent, all-electrical and single-shot read-out of two electron spins in a double quantum dot, with neglegible cross-talk between the two measurements and readout fidelities of ~86% on average. 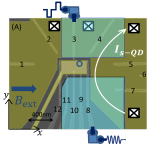 This allowed us to directly probe the anticorrelations between two spins prepared in a singlet state and to demonstrate the operation of the two-qubit exchange gate as the spins on the adjacent quantum dots are made to interact [Science 333, 1269 (2011)]. 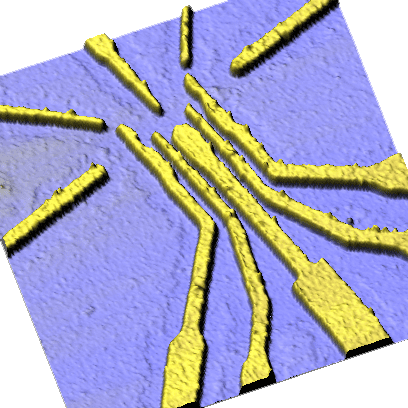 The nuclear spins in the quantum dot electron spin’s environment collective produce an “Overhauser” effective magnetic field on the electron spin. This nuclear field is normally uncontrolled and its randomness quickly dephases the electron spin. We demonstrate partial control over the nuclear field by exploiting electron-nuclear feedback: when applying microwave magnetic fields, we observe that the electron spin resonance frequency can remain locked to the excitation frequency, even when this excitation frequency or the external magnetic field are changed. The nuclear field thereby adjusts itself such that the electron spin resonance condition remains satisfied. We argue that this feedback reduces the nuclear field randomness by more than a factor of 10 [Nature Physics 5, 764 (2009)]. 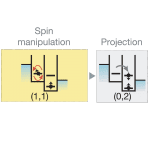 We realized magnetic resonance of a single electron spin in a quantum dot, whereby spin flips are induced via an oscillating magnetic field, generated on-chip. 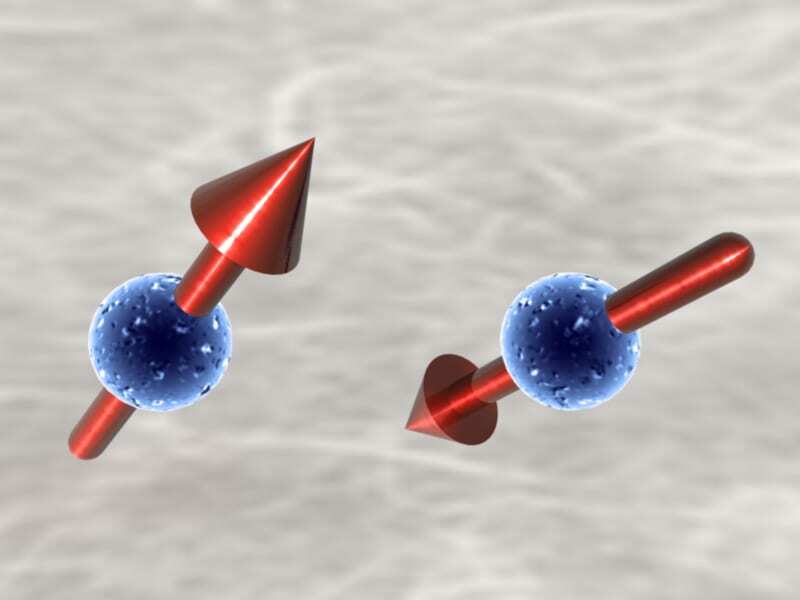 Electron spin resonance (ESR) in one quantum dot was detected with the help of a second dot that contained a reference spin, via a spin-dependent transport measurement through the two dots in series. Coherent control of the quantum state of the electron spin was achieved by applying short bursts of the oscillating magnetic field. We observe about eight oscillations of the spin state (so-called Rabi oscillations) during a microsecond burst. See also the press release or the article [Nature 442, 766 (2006)]. Equivalently, we have shown that aside from using oscillation magnetic fields, which are cumbersome to realize on chip, we can also flip single electron spins coherently using oscillating electric fields applied on one of the gates that are on chip already. The material-dependent spin-orbit interaction allows the movement of the electronic charge to couple to its spin degree of freedom, and as such allowed us to realize electrical dipole spin resonance (EDSR) [Science 318, 1430 (2007)]. See also two general introductions into these results and the state of the field at this point, one in English and one in Dutch. We studied decoherence of electron spins in a quantum dot caused by interactions with nuclear spins in the host semiconductor. From spin dependent transport measurements, we found that the effect of the nuclear spins on the electron spins can be viewed as that of a randomly oriented and slowly varying semiclassical magnetic field, with a magnitude of about 1 mTesla. When electrons flow through the device, the electron spins in turn act back on the nuclear spin bath, and cause dynamical nuclear polarization. This sometimes leads to a striking bistable behavior. See also the press release or the article [Science 309, 1346 (2005)]. We have also studied on what timescale an electron spin in a quantum dot can be flipped, thereby transferring its energy to the environment. 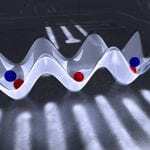 We found energy relaxation times of the order of milliseconds, both for single electron spin states and two-electron spin states. Furthermore, we established that the dominant heat bath where spin-flip energy is dissipated is the phonon bath (the phonons can couple to spin thanks to spin-orbit interaction) [PRL 98, 126601 (2007)]. 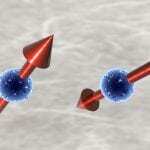 We have demonstrated single-shot read-out of single- and two-electron spin states in a quantum dot. As we allow an electron to escape from the dot or not depending on its spin state, we measure the dot occupation using a quantum point contact next to the dot. As such we transfer spin to charge information. 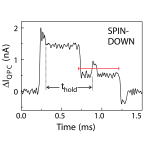 We have demonstrated two different ways for the spin-dependent escape; one method exploits the energy difference between the two spin states [Nature 430, 431 (2004)] and the other method exploits a difference in tunnel rates [PRL 94, 196802 (2005)]. Depending on the method, we achieved single-shot spin readout fidelities from 82% to 97.5%. 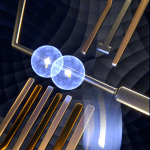 Isolation of a single electron in single and double lateral quantum dot structures. This was made possible by a special design of the dot and an integrated quantum point contact as a charge detector (see AFM image). 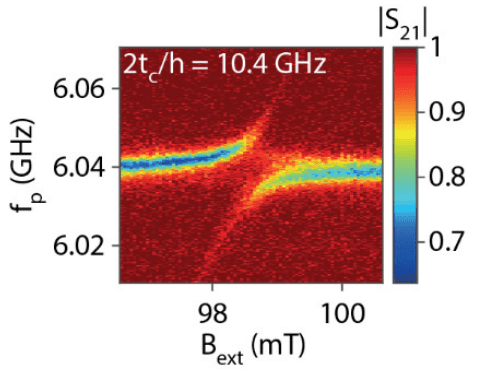 Observation of the qubit levels in a direct electrical transport measurement of the Zeeman splitting of one electron in a quantum dot in a magnetic field. The splitting is about 20 μeV per Tesla. For comparison, the orbital level spacing is 1 meV and the charging energy a few meV. Spectroscopy of a nearly-isolated quantum dot, by modulating the potential of the dot while monitoring the conductance through a nearby quantum point contact. 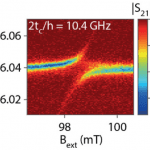 Real-time detection of single electron tunneling between the quantum dot and a reservoir, by monitoring the conductance fluctuations of a quantum point contact next to the dot. 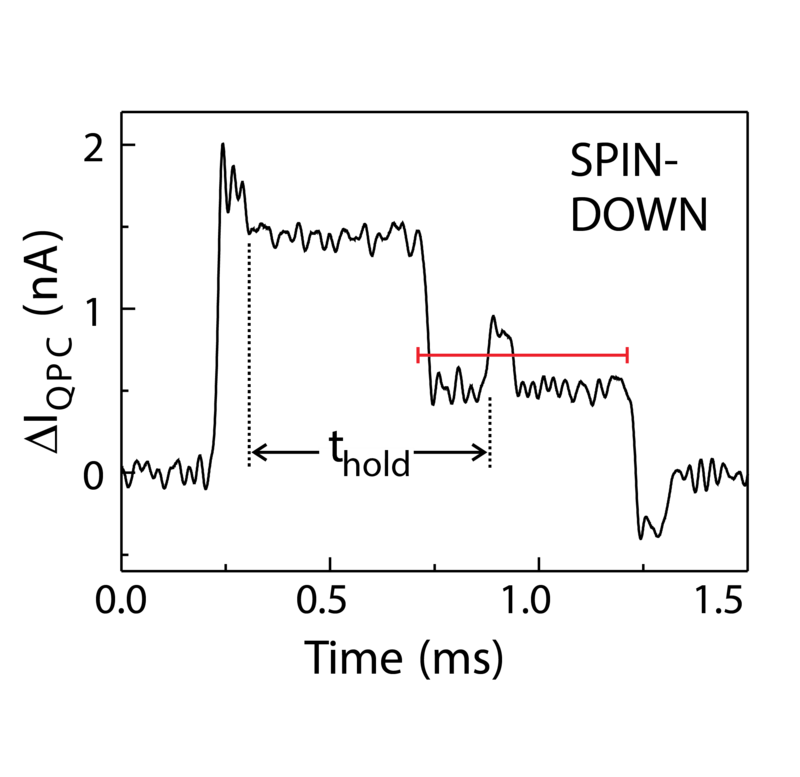 The shortest events we can see are about 8 μs.